New York ; London : McGraw-Hill, 2005.
vi, 282 p. : ill. ; 21 cm. 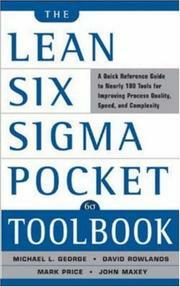 The lean Six Sigma pocket toolbook : a quick reference guide to nearly 100 tools for improving process quality, speed, and complexity / Michael L. George ... [et al.]. $c Statement of responsibility Michael L. George ... [et al.]. $c Date of publication, dist, etc 2005. 500 General Note $a General note Includes index. 650 Subj:Topic 0 $a Topical term Quality control. 650 Subj:Topic 0 $a Topical term Production management. 700 AE:PersName 1 $a Personal name George, Michael L.